I recently received a comment from the folks at http://www.crystalfrets.com/. The brainchild of artist Erich Stone, using quartz crystal for frets has to be one of the most radical innovations to have come along since Leo Fender's solidbody or Ned's all-graphite Steinberger. 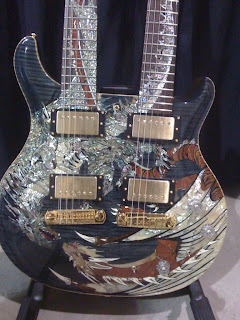 And according to Stone, guitars customized with the quartz frets take on a 'hi-definition' tone. And being crystal, these frets would probably be nearly impervious to wear. But rather than being an aftermarket add-on, the company plans to launch their own line of guitars. Which makes sense. You'd need specialized skills and tools to install quartz frets into wood fingerboards. 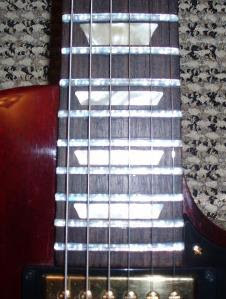 I can just see Paul Reed Smith incorporating these quartz frets into one of their heavily-inlaid NAMM showpiece guitars. "Imitation is the greatest form of flattery"
Thanks for this info! Time for GlassTones to drum up a bit of press about this perhaps?